Pietradolce is a relatively new winery, established in 2005, by Michele Faro and family. The family’s original small vineyard holdings have been augmented by hard won purchase from local farmers (‘contadini’) and now boast vines up to 120 years of age. 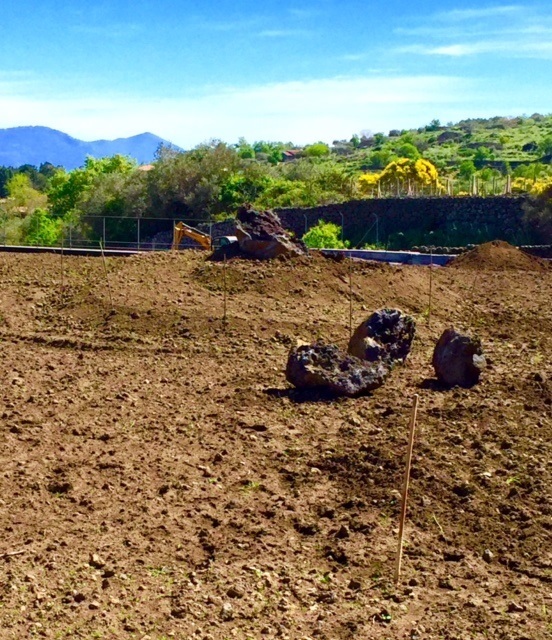 The winery and vineyards, in Solicchiata, are a stone’s throw from the crater of Mount Etna on the island of Sicily. Directly translated ‘pietradolce’ means sweet stone, and this is a reference to the stony, rugged terrain of the foothills of Mt Etna, where the vineyards are often terraced with the volcanic rocks moved to form them. 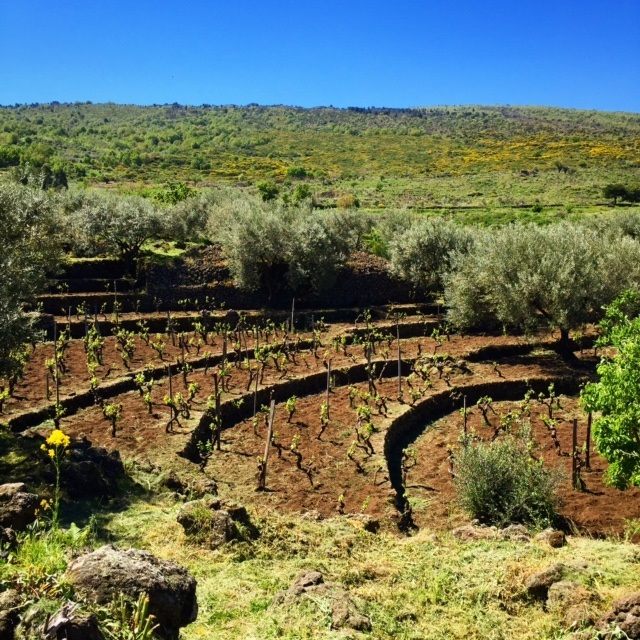 The vines are nourished by rich volcanic soils and flourish in the cool climate of the northern and eastern slopes at between 600 and 900 metres above sea level. Most of the older plantings are “bush” pruned, with younger vines espaliered. 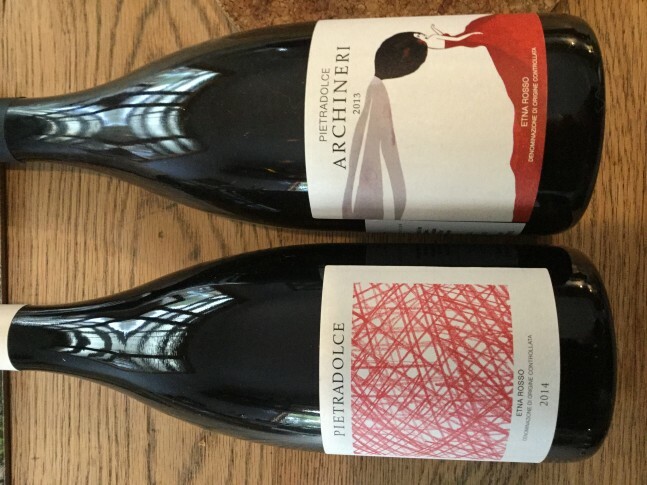 These wines are unique, made from native Italian varietals: Carricante with its steely, pure acidity and complex, subtle mineral and fruit notes, and Nerello Mascalese with its misleading pale-ish colour and soft persistent, red fruits, hints of tobacco and fine tannins. 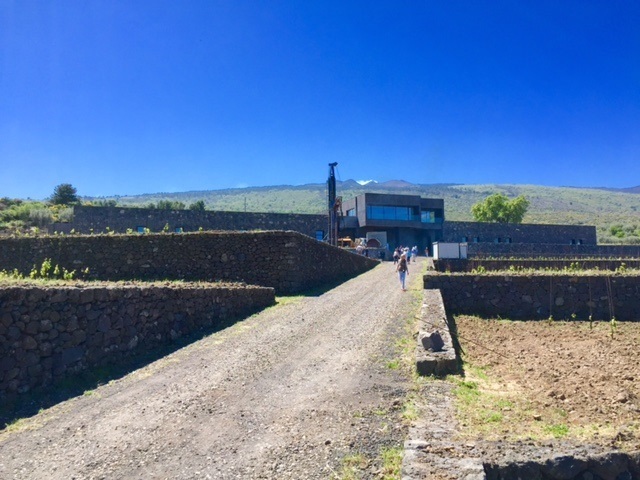 When I say a “stone’s throw” from the crater, the winery is approximately 50 kilometers away from Mount Etna, but its awesome power enables it to send the odd lava bomb over that distance. Pietradolce Etna Bianco DOC 2014 is entirely Carricante, fermented in stainless steel. Bright, pale and slightly lemon-tinged, shy but vibrant, crisp and savoury with hints of minerals, pear, peach and nectarine. This expressive wine with its cleansing acidity begs for a plate of seafood. 13%a/v, Diam closure – $A35. Pietradolce Etna Bianco ‘Archineri’ DOC 2014 is again 100% Carricante, this time from vines 100-120 years old, grown at 850m above sea level on the eastern slopes of Mt Etna. Pale colour, lemon tinged, this is super-intense, pure, long and fine showing nectarine and grapefruit nuances, with slaty acidity. This has such poise and balance, it should age well over three to five years. 13.5% a/v, good quality cork – $A65. Pietradolce Etna Rosso DOC 2014 is made from Nerello Mascalese grown on the northern slopes of Mt Etna. The pale-ish brick red colour is disarming, as the wine is fragrant showing wild berry red fruits over a silky palate framed by firm but ripe tannins. I have never tasted volcanic soil, but with the power of suggestion there is an underlying smoky/earthy/ferrous complexity which is intriguing and alluring. This has spent a modest amount of time in oak and is for current drinking, particularly with roasted white meats. 14% a/v, Diam closure – $A35. Pietradolce Etna Rosso ‘Archineri’ DOC 2013 is all Nerello Mascalese from 80-90 year old vines grown at 850m above sea level on the northern slopes of Mt Etna. Colour is medium dense and both nose and palate display abundant red fruit characters. Very serious wine, lively, flavoursome and balanced, textured and spicy with fine tannins. It spent approximately 14 months in oak (20% new) and has extra layers of richness and complexity to show for it. Drinking well now this wine has the balance and depth to age for another four to five years. 14% a/v, quality cork – $A65. These wines are imported into Australia by Trembath & Taylor (www.trembathandtaylor.com.au) and are well worth seeking out for their uniqueness and quality.